So who came out on top? For the second year in a row, the student team from Laval University in Quebec, Canada took home the grand prize with an astonishing 2,487.5 miles per gallon, equivalent to 1,057.5 kilometres per liter, in the "Prototype" category. And in the "UrbanConcept" category, the team from Mater Dei High School in Evansville, IN took the grand prize for the second year in a row by achieving 437.2 mpg, equivalent to 185.87 km/l. The challenge kicked off on Saturday, March 27 with Shell Oil Company President Marvin Odum waving the green start flag and Houston Mayor Annise Parker proclaiming "Shell Eco-marathon Americas Day." With 48 vehicles testing on the Houston street course, competition was steep. This year's challenge brought together a number of returning teams determined to beat the winning 2,757.1 mpg (1,172.2 km/l) achieved by Laval University in 2009, combined with a number of new teams adding fresh innovation and vehicle designs to the competition. "The competition was tough this year, plus participating on a street course for the first time was a whole new experience for us," said Bruno Leduc of Laval University. "We put a lot of time and energy into our vehicle this year and are very proud of how we did. We are excited to be the Shell Eco-marathon Americas champions again in 2010!" "The 2010 Shell Eco-marathon Americas is a challenge that brings together high school and college students from across the Americas to push the boundaries and design mobility solutions," said Mark Singer, global project manager for the Shell Eco-marathon. "And, it is a clear demonstration that we're never too young to start making energy innovations and efficiency a priority. It was inspiring to see these vehicles of the future on the streets of downtown Houston this year." Student teams were invited to participate in either the Prototype or UrbanConcept categories. For the Prototype category, teams entered futuristic prototypes - streamlined vehicles focused on maximizing fuel efficiency through innovative design elements, such as drag reduction. For the UrbanConcept category, teams entered more "roadworthy" fuel-efficient vehicles. Aimed at meeting the real-life needs of drivers, these vehicles are closer in appearance to the cars seen on roads today. For both categories, teams can use any conventionally available energy source - including fuels such as diesel, gasoline and liquid petroleum gas (LPG), as well as alternative fuels such as hydrogen, biomass and solar. The 2010 Shell Eco-marathon Americas roster contained 42 teams from 9 high schools and 28 universities from across the Americas. Additionally, one guest team from Italy joined the roster with their Prototype vehicle. The Prototype entries included 28 vehicles powered by combustion engines, five by fuel cell/hydrogen technology, two by solar power, and two by diesel fuel. The UrbanConcept entries included six vehicles powered by combustion engines, two by diesel fuel, one by fuel cell/hydrogen and one by solar power. With mileage of 2,487.5 mpg (1,057.5 kilometers per liter) the Alerion Supermileage team from Laval University of Quebec, Canada won a US$5,000 grand prize with their vehicle, NTF 4.0. The Cicero North Syracuse High School team from Cicero, N.Y. achieved 780.9 mpg (331.99 km/l) in its Clean Green Machine vehicle. The Purdue University Solar Racing Team took first place with its solar vehicle, Pulsar, which achieved 4,548 mpg (1933.5 km/l). With mileage of 437.2 mpg (185.87 kilometers per liter) Mater Dei High School's Supermileage Team won a US$5,000 grand prize with their vehicle, George. Purdue University's Pulsar vehicle took home the "People's Choice Award" with an incredible 97,076 votes! Granite Falls High School received second place with 88,377 votes for their Iron Maiden vehicle and third place with 54,357 votes for their Phillipe's Bulldozer vehicle. A special "Eco-Design Award" was presented to the University of California, Los Angeles team for their reuse of so many vehicle parts. Their special design not only contributed to the fuel efficiency of their Frankenstein vehicle, but incorporated repurposed materials into the vehicle and production process. The "Safety Award" recognized three teams who made the most extensive efforts to comply with the safety regulations of the Shell Eco-marathon Americas. This award went to Monrovia High School, Benton High School and Granite Falls High School. These teams all demonstrated safety as a top priority in vehicle design and construction. The winner of the "Technical Innovation Award" goes to Purdue University for their patent pending carbon fiber construction technique. Their solar cell encapsulation preserves flexibility allowing integration with the vehicle's curved body shape. The 2010 Shell Eco-marathon Americas "Design Award" was presented to Louisiana Tech University. This award recognized their innovative design research related to ergonomics, aesthetics, choice of materials and technical feasibility. The originality and overall coherence of their design were also taken into account. This award recognized the Purdue University team who made outstanding communications efforts concerning the Shell Eco-marathon. All actions throughout the year are taken into account: participation at trade shows, creation of a Web site and all other activities that successfully promote the competition, its name, founding principle, educational aspects, etc. in the team's country of origin. The "Best Team Spirit Award" was presented to the Louisiana Tech University team who fostered cooperation and collaboration among their team and others at the competition. Not only did they demonstrate initiative to learn more about other teams and contribute to the morale at the competition, they also brought an incredible alumni group out to the event. The "Perseverance in the Face of Adversity Award" was presented to University of Missouri. Despite operating without sleep, they showed a can-do attitude and kept smiling each day at the Shell Eco-marathon Americas. The 2010 Shell Eco-marathon Americas event sponsors included the City of Houston, Autodesk, Michelin, Pennzoil, and SKF USA Inc. Event photos, complete results and videos are available at www.shell.com/ecomarathon. For more information contact the Shell Media Line at 713-241-4544. For b-roll, visit www.badertv.com/eco-marathon. 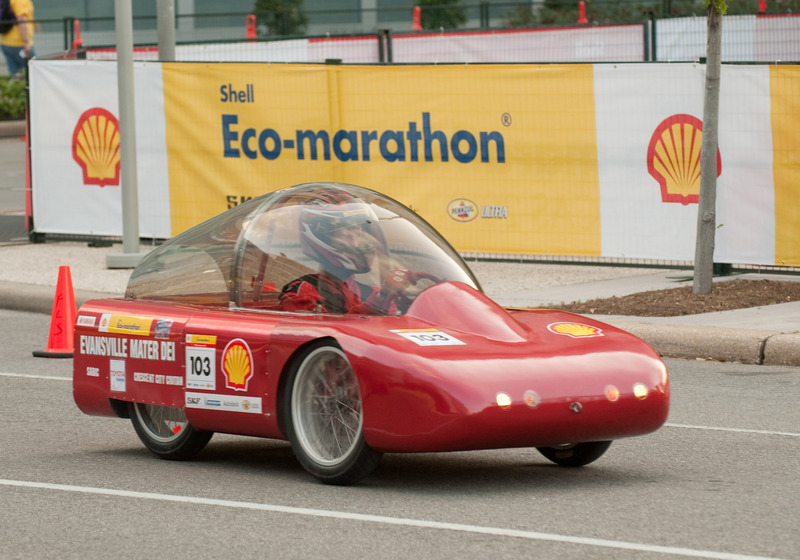 The Shell Eco-marathon Americas energy challenge will return to the streets of Houston in 2011. Shell Oil Company, including its consolidated companies and its share in equity companies, is one of America's leading oil and natural gas producers, natural gas marketers, gasoline marketers and petrochemical manufacturers. Shell, a leading oil and gas producer in the deepwater Gulf of Mexico, is a recognized pioneer in oil and gas exploration and production technology. Shell Oil Company is an affiliate of the Shell Group, a global group of energy and petrochemical companies, employing approximately 104,000 people and operating in more than 110 countries and territories.